The opening of the new $65 million Robert and Beverly Lewis Integrative Science Building, designed from the ground up for interdisciplinary research. The Lewis Building will encourage even more collaboration across departments and represents the future of research excellence at the UO. Numerous grants and awards, including a recent partnership for innovation award from the National Science Foundation to accelerate the commercialization of inorganic nanoparticle technologies, and an award from the Department of Education to fund new courses and enhancements to the Latin American Studies (LAS) Program and Center for Latino/a and Latin American Studies (CLLAS). Stories on faculty members who excelled, such as chemistry professor Geri Richmond, appointed to the National Science Board by President Obama; and scientists with the UO's Center for High Energy Physics who played a pivotal role in the recent discovery of what could be the elusive Higgs Boson particle. UO received $8 million in licensing income from UO innovations in the 2012 fiscal year, representing the university's highest return on research innovation (8.9 percent) to date. Sponsored expenditures in fiscal year 2012 totaled $121.7 million. Research creates jobs for the people who live in Oregon, pay state taxes and send their children to our schools. 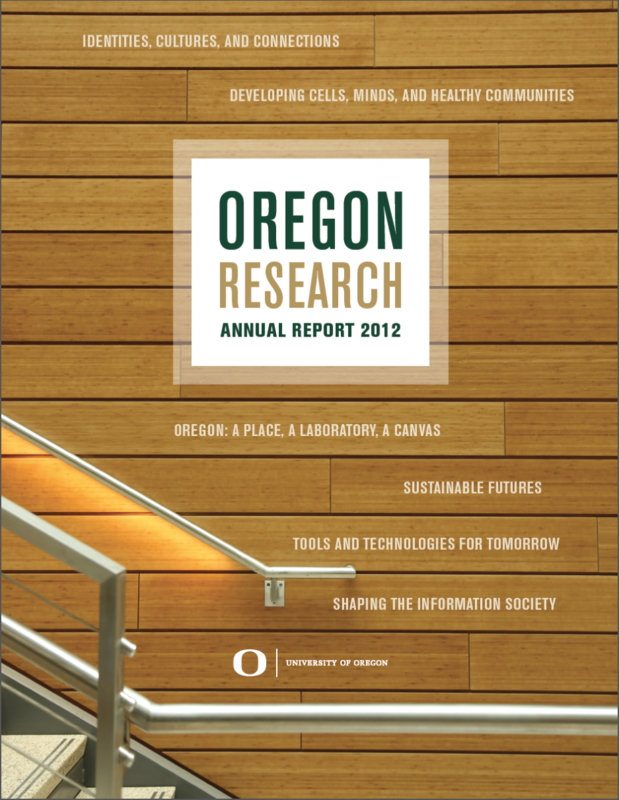 UO faculty members were awarded $110.6 million in grants and contracts for 2011–12. The team of researchers in the BioBE Center that is leading the way in a hot new subspecialty. A researcher in the college of education who is envisioning a more thoughtful approach to modern global education. The team behind the Paisley Caves discoveries that are providing new insight into the earliest North Americans. A UO spinout capturing the attention of drug manufacturers with its microfluidic device.